I’m so excited to announce that Dreamthief is getting a makeover! After speaking with my publisher, we decided the original cover doesn’t really fit with the urban fantasy genre. Although I still love the old cover, this new cover more accurately shows my main character in her element. What do you think? We’ve also got some new updates for the Fairy World MD series. Hint: I’m working on some amazing bonus scenes. Oh my goodness, this has been so much fun! I get to write about Olive and Kull again!!! You have no idea how amazing it is to write about these characters again. They hold a special place in my heart. The bonus scene I’m currently working on takes place when Olive is creating her magical mirror box. I can’t wait for you all to read it! We’ll be releasing it soon along with a fancy new boxed set, so be on the lookout. This is one bonus scene you really don’t want to miss. CHECK OUT THE NEW COVER ON AMAZON! 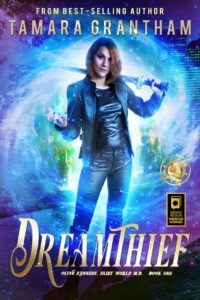 Also, if you’d like to grab a free copy of Dreamthief, it’s part of a giveaway for a days only. I’m hosting it along with 43 other free books from fantasy and sci-fi authors. Yes, you can grab up to 43 books for free, so be sure to check it out! dreamthief, Fairy World MD, New Cover. Bookmark.